Seeking a speedy midnight meal or a feast fit for a Friday night spent feasting in front of your favourite film? Forget the frozen pizza or baked beans on toast, and throw together a feel-good meal that’s full of flavour and wholesome foodstuffs. You know the best bit? We’re not exaggerating when we say it’ll take less than 15 minutes to make – you’ll be watching Hocus Pocus for the 37th time before you know it. This one’s ideal for the busy vegan wrens out there too. First, get your eggplant frying. Heat a little olive oil in a fry plan, at a reasonably high heat, and lay your sliced (or diced) eggplant in the pan. Lightly salt your eggplant first, to remove a little of the bitterness, if you prefer. Cook each side through, until it’s nice and mushy, browning a little. While the eggplant’s cooking, throw in your chickpeas with a dash of olive oil and your spice mix into a small saucepan or another fry pan. 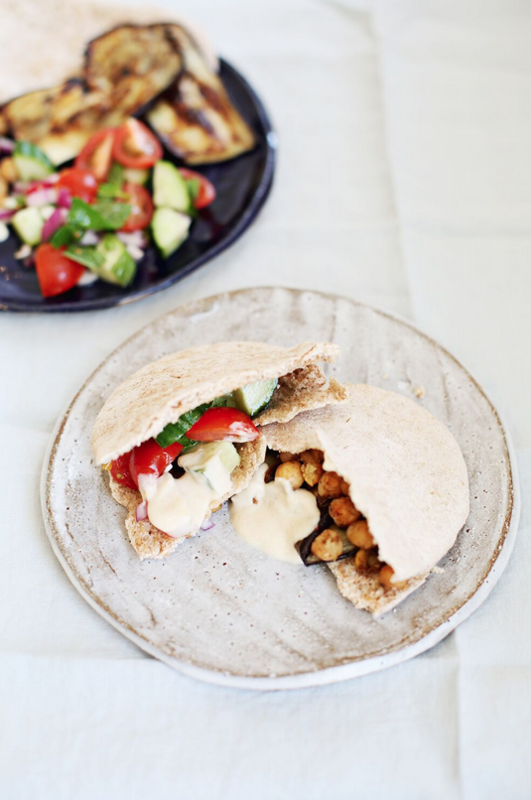 Mix it in so the chickpeas are nicely coated in flavour and heat through. Tinned chickpeas are already cooked, so you just want to crisp them up a little. This will only take a few minutes. Now, to the side, roughly chop your tomato, red onion and cucumber (and parsley, if you’re using it). Then, mix together your tahini and lemon juice to make the sauce. 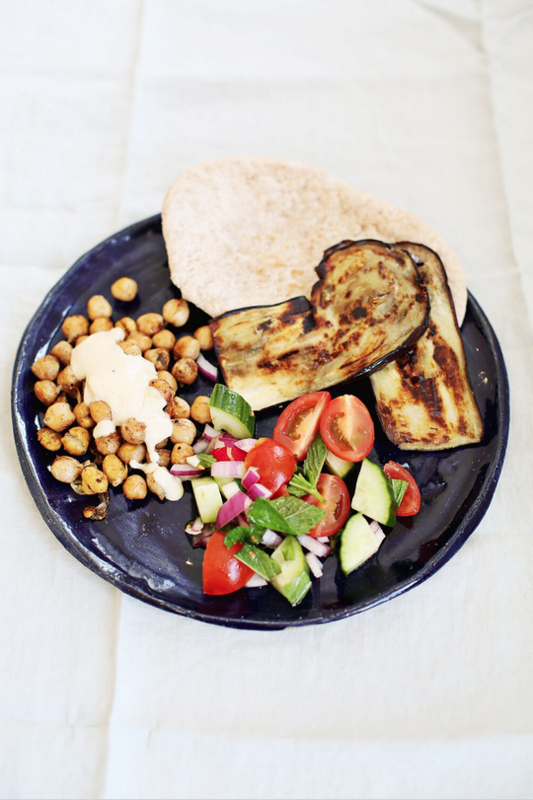 Assemblage is easy: fill your pita or flat bread with the fried eggplant, warm chickpeas and then pour on your sauce. Lastly, top your delicious dinner with the salad ingredients. Of course, you can spread out your ingredients and devour as a platter, if your prefer. 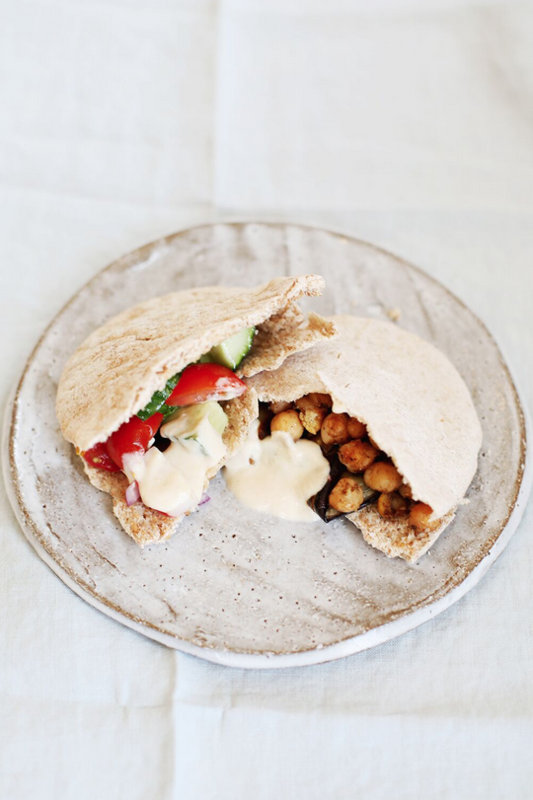 Once you’ve stuffed your pita, you’re ready to stuff your face. Enjoy! And do share your photos with us on Instagram if you happen to try out this recipe. Photos by Lara Messer, plates by Kana London.